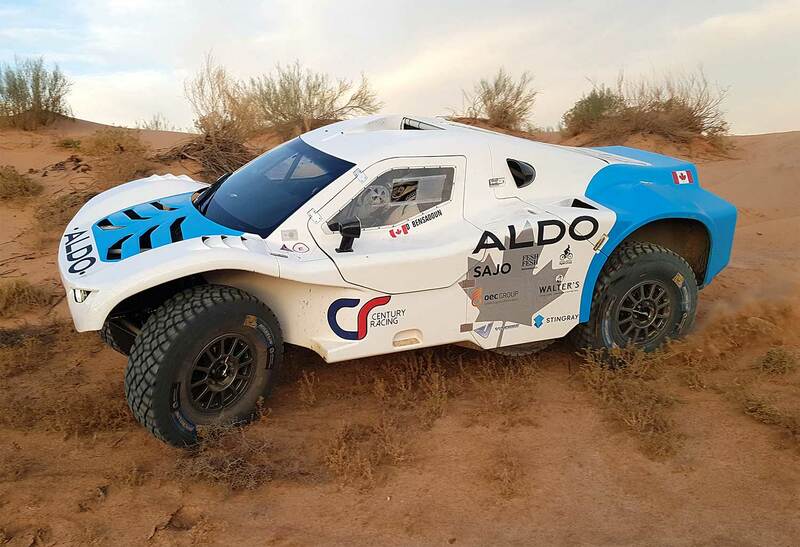 On Tuesday evening, the Canadian ALDO Racing Team of David Bensadoun and Patrick Beaulé unveiled their brand-new rally-raid vehicle: The FIA homologated ALDO Racing CR-6, which is powered by a 7-liters Chevrolet Corvette V8 engine that delivers 505 hp @ 6,300 rpm to its two rear wheels. The CR-6 is the creation of South Africa-based Century Racing, which has been building off-road vehicles since 1996 and adapting cars to rally-raid racing. Years of research and development since launching their CR-1 in 2008, has been required to produce the ultimate CR6 prototype. In October 2017, CR-6 chassis number 3 was ready for its first test, and Bensadoun and Beaulé flew halfway across the world to South Africa to try out their new car prior to entering it in the eighth edition of the Silk Way Rally (SWR), which is scheduled to run July 15-27, 2018. "The CR-6 is an amazing machine," said David Bensadoun. "Pat and I will need to adjust our driving style to take advantage of its performance. 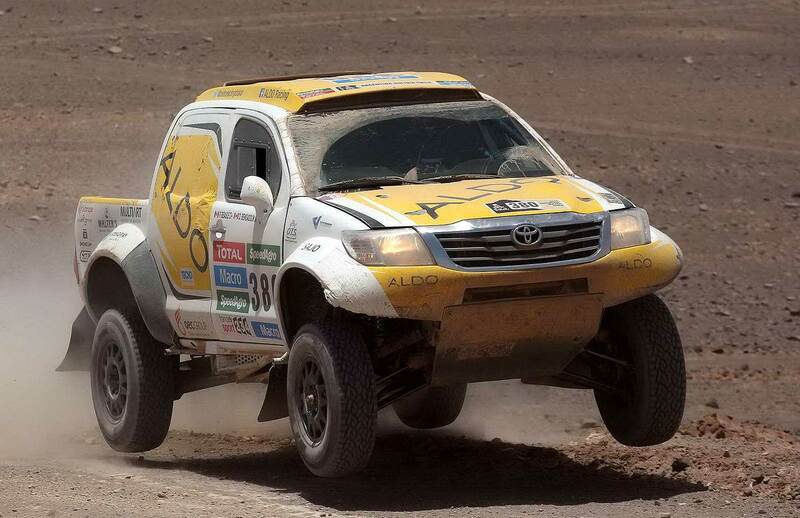 There are two places where the car is much faster than our Overdrive Toyota Hilux - on rough tracks, it is at least 30% faster because it has more than double the suspension travel at 415 mm, plus it's riding on 37-inch versus 31-inch tires! On flat terrain it has a top speed of 205 km/h, 25 km/h faster than the Toyota. 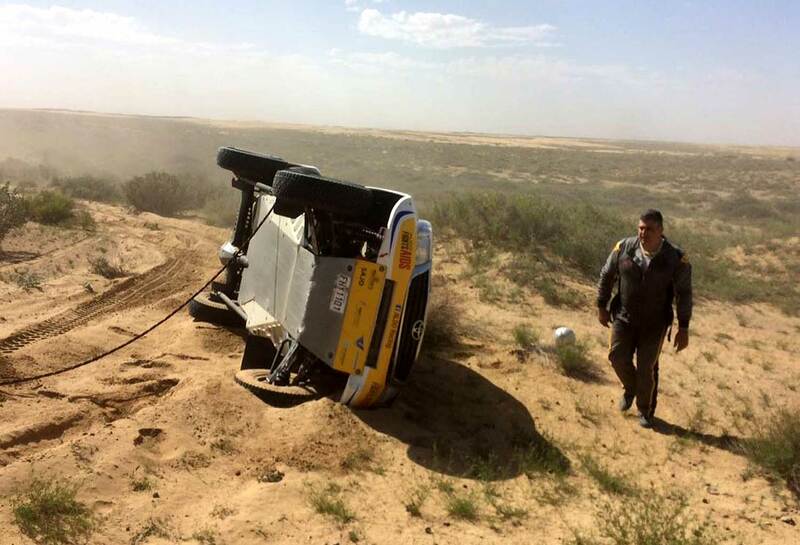 "Where we have to be careful is in the dunes - because the new CR-6 is only a two-wheel drive - we need to keep up our speed and have flowing lines to maintain momentum. We won't have the luxury of stopping in the dunes to make sure we're on the right bearing or to double check a dune crossing strategy. If we stop in the dunes, we're cooked! The car will be tough to get moving from a dead stop in soft sand - very high risk of getting stuck! The other place where it's at a disadvantage is in very technical rocky climbs - that's where the four-wheel drive really shines. We'll have to be careful and patient in these sections," concluded David. The ALDO Racing CR-6 will probably do more travelling this year than a lot people will experience in a lifetime. From South Africa to Montreal, then across Canada to Vancouver, followed by a sailing trip to China. Then David and Patrick will race it across Asia to Moscow. After the rally, the vehicle will go to Finland to be shipped back to Montreal. The CR-6, which will travel the world in 2018, will be in Montreal until the middle of May where it will undergo several changes under the supervision of ALDO Racing Team coordinator Stéphane Desrochers and co-navigator Patrick Beaulé. The team will then test the car for several days. "I am so pleased that the car has finally made its way to Montreal," said Patrick Beaulé. "We will be able to put the finishing touches on it and work on the cockpit to make it comfortable for both David and myself. During the upcoming late April test sessions, we will work with Quebec-based Elka Suspensions to select the most appropriate sets for the rally. "With all the logistics required to ship to China, I am glad that all our material, which besides the rally vehicle includes our support and transport trucks, all the overnight bivouac camping equipment, the unbelievable amount of backup spare parts and so much more, are now stored in Montreal. We will be able to ship everything to its final destination from a single departure point. This will make our job much easier."